In the following, I will give a brief account of the instruments deployed to meet these objectives. The Mediterranean program (program director: Thierry Fabre). Created in 2017, this program has three main components (not exclusive): critical thought in islam or the sake for a Mediterranean islam; lifestyles in the Mediterranean and finally, prospective studies in the Mediterranean. Crossing paths- Exploring interdisciplinarity (program director: Thibault Gajdos). Initially, this program was essentially open to all questions related to the philosophy of science and epistemological studies, in particular in relation with the concepts of interdisciplinarity and transdisciplinarity. It is now much more focused on neurosciences, cognitive sciences, and learning and artificial intelligence to take advantage of some of the major strengths of our university environment. Art, Science and Society (program director: Pascale Hurtado). This is one of the oldest programs of IMéRA, and probably the most efficient so far in experiencing interdisciplinarity, it’s the par excellence program for experimentation. Artist residences at IMéRA are not retreats and are typically concrete experiences of cross-fertilizations between artistic and scientific approaches. Global phenomena and regulation (program director : Raouf Boucekkine). This is the “youngest” program of the institute, it is devoted to all the aspects of globalization (including migrations, sustainable development, energy transitions and cultural dynamics), and it’s a major tool to build joint partnerships with important national and international institutions. Each program is organized around a few chairs, typically created thanks to partnerships with external institutions. For example, the Averroes chair devoted to critical thought in Islam is instrumental in the research activity in the Mediterranean program. The chair holder is entitled to give a series of lectures (also called research cycles) and, together with the program director, he/she is requested to animate activities in the area covered by the chair in connection with the other residents of the program involved in the islam’s critical thought area. About 12 chairs (or residence supports) have been created at IMéRA in the recent years, the complete list is given below within the section on partnerships. These chairs have a triple role. One is, of course, cofunding, and roughly speaking, this is the main reason behind the creation of the chairs in anticipation of resources drying up after 2019: chairs are financed or cofinanced on the basis of a 3-years term with a renewal mechanism. A large majority of these chairs are run with partners outside the university, which is important for the independence of the institute. Second, as the chairs are joint partnerships with important (academic) institutions, they do increase the scientific and institutional visibility of IMéRA. Last but not least, chair holders are typically senior researchers with large international visibility and expertise, which bodes for potential large positive externalities on research quality at the institute and in the university. - First of all, IMéRA’s residents (individuals and teams) are connected with the appropriate Aix-Marseille University (AMU) labs and institutions, and with the different cultural and scientific institutions of interest active in the area as well. The program directors are requested to establish or at least to suggest the links, but it goes without saying that the networking job has to be done primarily by the residents. This is one of the most efficient ways for the residences to have a long-lasting effect on the local scientific and artistic community. - Second, for all the residents wishing to give short doctoral (interdisciplinary) lectures, IMéRA has been organizing such events for a while together with the doctoral college of AMU. From 2019/2020, the institute will open an IMéRA Doctoral Program, in collaboration with a few AMU doctoral schools, to gain flexibility and increase attendance. - Third, IMéRA is encouraging its residents to engage in international (mainly European) grant applications individually or with AMU researchers. In the past year, two American residents at IMéRA have been put in touch with the ERC grants administrative unit of the university to help in setting up ERC applications. - Fourth, IMéRA is “investing” in the UBIAS network since the Sao Paulo meeting, March 2018. It will host the next UBIAS meeting in March 2020, and is engaged in co-organizing the fourth ICA (intercontinental academy) on “Intelligence and artificial intelligence”. This is for us the right network to bring our university in close contact with some of the major universities and major esearchers in the world. - Resident fellow: this is the ordinary residence, it is individual and can last 5 or 10 months, it includes residences with chair supports. - Senior fellows: This position is open to former residents since 2018-2019, typically those who have been able to build up local networks during their residence time. Senior fellows are selected upon submission of an innovative interdisciplinary three-years long research project, with the additional compulsory requirement of proposing an explicit support team composed of researchers of the region (from AMU and outside AMU). Senior fellows are appointed for three years, presence is required 5 months per year (allowances paid for this period). - Associate fellows: Associate fellows are also drawn from the population of former fellows, and invited to the institute for short periods (a few weeks typically) for different motives. Usually, associate fellows are engaged in the interdisciplinary teams selected on the basis of an interdisciplinary project. IMéRA hosts from 2 to 4 teams of this type every year. The team is headed by an AMU researcher and includes up to 5 researchers, with 2 or 3 based out of France, including one or two former residents. Again, in this precise case as in the case of senior fellows, this form of residence rewards active networking during ordinary residence. In our view, it’s another key tool to assure successful community building. Associate fellows may also be chosen among former residents who can be particularly useful for the institute in launching an important initiative, like a new (innovative) research cycle in which they hold a particularly prominent expertise. - AMU fellow: This is the new form of residence we plan to start in 2019-2020. AMU fellows are recruited among AMU professors (in particular the youngest) upon submission of an interdisciplinary project for a residence duration of 5 or 10 months. We plan to select about 3 to 4 AMU fellows per year. They are selected at the same time as the “international” fellows, the idea being to identify a priori some interesting interdisciplinary associations between the internal and the external fellows. The cost of an AMU fellow is the cost of her teaching load (about 11000 euros per year). From September 2016, the Community Building Seminar of IMéRA has been the main interaction place in IMéRA. The seminar takes place every Thursday in the morning with an average duration of 2 hours and half, followed by a lunch. Many CBS take a non-academic form, especially those driven by artists; they can be on any topic, general questioning or methodological point (like counterfactuals for example). Non-residents can be invited to the CBS, in particular to bring an interdisciplinary or disciplinary approach distinct from the main speaker’s. The CBS is also the right place to evaluate the abilities of the residents to lead a team or a new research cycle (and therefore to come back as an associate or senior fellow), or to be potentially interested in a longer relationship with IMéRA/AMU via ERC applications. About 30 CBS are taking place every year. In addition to the CBS, the residents may be involved in the organization of research cycles, they may also organize workshops/conference, individually or in cooperation with other residents or AMU researchers. Typically, chair holders are tightly associated with the organization of the research cycles. For example, Yadh Ben Achour (former Dean of the law faculty at Tunis) has delivered a series of lectures within the Averroes chair he has been holding since September 2018. Andy Dobson (Princeton) and Mercedes Pascual (Chicago) have been co-organizing, together with the corresponding program director, a research cycle on Sustainable Development within the chair on the same topic, financed by the Institut de Recherche en Developpement (IRD). And so on. As mentioned repeatedly above, IMéRA has been quite active in chair creation in the last 2/3 years. We have already explained the rationales behind. We now list them in order to show the wide variety of partnerships, from academic to non-academic, from AMU to non-AMU, and from national to international. Among the 12 partnerships listed below, 9 are chairs and 3 are residences: the former bear on specified topics and fields, the latter no. – The IMéRA/IRD chair on Sustainable Development. This is the first chair created, the corresponding convention was signed in July 2016, and the first holder was Carla Makhlouf (American University of Beirut, former Harvard professor) in 2017-2018. In this case, the partner is IRD, a French national institution with headquarters in Marseille. In 2018-2019, the co-holders are, as mentioned above, A. Dobson (Princeton) and M. Pascual (Chicago). – The IMéRA/Fulbright chair on Migration Studies. Here, the partner is an international academic institution, the French-American Fulbright Commission. The agreement signed has two distinct components: a chair on migration studies is co-financed from 2018 (the first holder being Thomas Macias, University of Vermont, 2018-2019), and IMéRA also commits to enter the new Fulbright Specialist program aiming at stimulating the trilateral exchanges between Africa, France and the US (the first holder being Aliko Songolo, University of Madison-Wisconsin, from January to March 2018, 3 weeks at IMéRA and the remaining time at Université Gaston Berger de Saint Louis, Sénégal). – The IMéRA/EHESS chair on Transregional Studies. The partner is one of the most prestigious French academic institutions, Ecole des Hautes Etudes en Sciences Sociales (EHESS). The first holder is Ben Kiernan (Yale), the main international scholar in the Cambodian genocide, among others. – The IMéRA/AUF chair on Structural Transformations and Institutional Dynamics in Francophone countries. Here the partner is a key international academic player in the French-speaking area, Agence Universitaire Francophone. The chair is open to all researchers in the world outside France, including those from academic institutions which are not members of the AUF. The AUF is only financing two other chairs, one with the Collège de France and the other with The Belgian Royal Academy of Science. Mobility of the three chair holders between the three places is assured by convention.The first holder will be welcomed in September 2019. – The Averroes chair: This chair is co-financed by A*MIDEX (AMU foundation) and another foundation, Fondation Islam de France, which is national. The first holder, as mentioned above, is Yadh Ben Achour (former Dean of the law faculty at Tunis) in 2018-2019, who is incidentally the main figure of the Tunisian transition in 2011. – The Germain Tillion chair, “La Méditerranée, demain”. This chair is financed by the regional goverment, Région Sud. It is devoted to prospective studies on the Mediterranean with emphasis on the sustainable development issues. The first holder will be welcomed in 2019-2020. – The IMéRA/ILCB chair on Language and Brain. This chair is financed by the Institute for Language, Communication and Brain (ILCB), a so-called convergence institute (institut de convergence), an AMU institute of excellence built up with public funding after a national contest. As mentioned above, the emergence of such unique entities within the university was one of the main reasons for which IMéRA has been switching gradually from epistemology to cognitive and neurosciences in the Crossing Paths program. The first co-holders of the chair are Dezso Nemeth (Hungarian Academy of Science) and Marie-Lise Giraud (University of Geneva) in 2018-2019. – The Camus chair on Mediterranean Lifestyles. This is the first residence for writers created at IMéRA. It’s a 5 months residence financed by A*MIDEX, the university foundation, and as it transpires from its name, it is part of the Mediterranean program. The first holder is Hyam Yared (Lebanon) in 2019, the next holder will be Alaa El Assouani (Egypt). – The IMéRA/MUCEM residence. 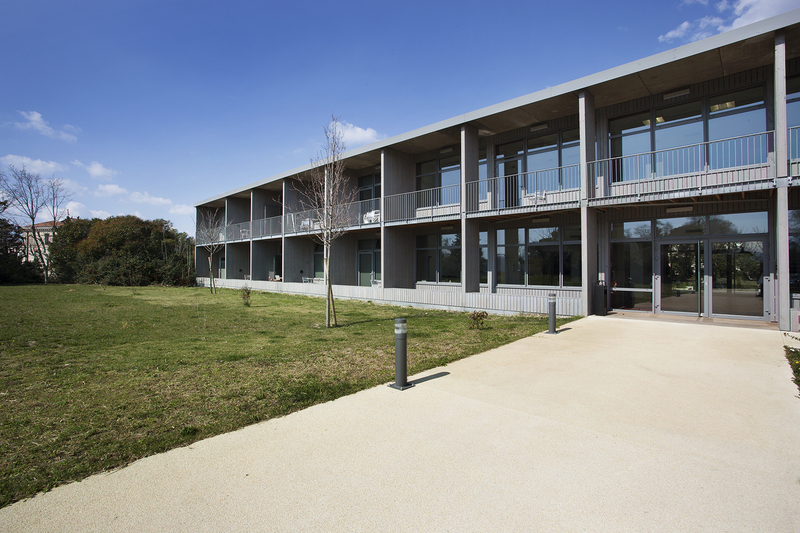 This residence is co-financed by MUCEM, the Musée des Civilisations de l’Europe et de la Méditerranée. It is devoted to host residents mainly specialized in cultural and museum studies. The current holder is Marta Jecu. – The IMéRA/AMSE residence: AMSE, Aix-Marseille School of Economics is one of the 29 so-called Ecoles Universitaires de Recherche, recently selected in a national contest. AMSE has committed to finance the IMéRA/ AMSE residence for a period of 10 years (from 2018-2019). The current co-holders are Omar Licandro (University of Nottingham) and Ramses Abul Naga (University of Aberdeen). – The IMéRA/INSERM residence. This residence is co-financed by INSERM (Institut National de la Santé et de la Recherche Médicale), the main national institute in the field. Incidentally, this is the main residence in which interdisciplinary research within hard sciences is experimented. A good example of such a residence type is Sarah Barman (School of Computer Science and Mathematics, Kingston University, London) whose 2018 research project on “automated detection and quantification of intraretinal exudative cysts in macular edema using OCT” explores the use of deep learning methods in ophtalmological research and practice. The deployment of the development instruments described above is obviously aimed at ensuring the medium and long-term viability of IMéRA. In terms of funding, at least the recruitment of interna-tional residents at the highest level worldwide, our institute can rely on the dynamics of chair creation as described above. With the current stock of joint chairs/residences, the institute can consolidate its development without relying too much on the university foundation, A*MIDEX. More initiatives are under way to identify other potentially successful partnerships, notably in energy studies, art/science and neuroscience. Obviously, the renewal of the LABEX RFIEA+ gives even more flexibility to IMéRA, in particular to finance projects which topics do not fall in the list of chairs/residences given above. In terms of functional viability as a UBIAS, IMéRA has already done a lot and is planning to do even more with notably the design of AMU fellowships and the kick-off the IMéRA doctoral Program next year. Also the privileged position of IMéRA within the international network UBIAS is an important guarantee to keep on raising the standards in the institute and in the university as a whole.